Windows 8’s built-in handwriting-to-text translator on your tablet works quite well in many situations. Sometimes, however, it’s overkill. For example, nobody cares about grammar or even misspellings in a grocery list. That’s where the Windows Journal program comes in. It works just like paper: You write your notes, and the program saves them as handwritten notes — they aren’t automatically converted into text. There’s a twist, however. Windows still recognizes your words enough to index them, making them searchable — a handy way to ensure that you can retrieve them down the road. The Windows Journal program isn’t available on tablets running Windows RT. Instead of facing a blank sheet of paper, begin with a template by tapping the File menu and choosing New Note from Template. There, you can choose from lined paper, graph paper, office memos, a monthly calendar, musical notation, or even a To Do list with check boxes. Describe your note’s contents along the top in the Note Title box. Then, when you tap the Save button, Windows automatically saves your note using the words you’ve written as the Note Title. To find a note later, use the Charms bar’s Search Files feature, and type a word from one of your notes. 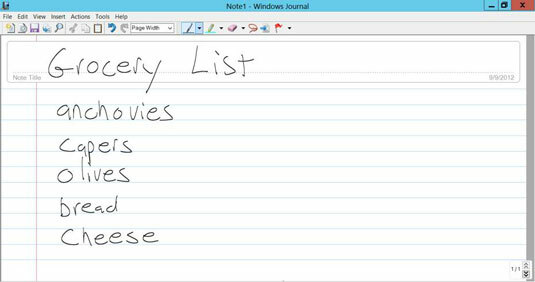 Because Windows indexes all of your journals, it will locate your note, where you can load it with a tap of its name. To e-mail a note, tap the File menu, choose Send to Mail Recipient, and select the format to send it in. Unless the recipient also uses Windows Journal, choose Web Page as the format. Then the recipient can read your note — but not edit it — in the browser.